I would like to draw your attention to a recent venture shared with many other botanical artists and the Royal College of Physicians. 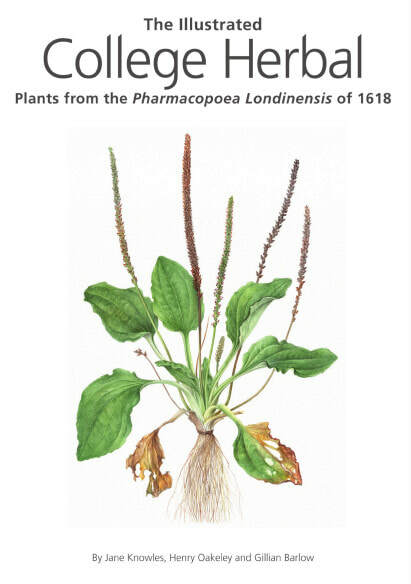 To celebrate their 500th anniversary the RCP, in collaboration with Gillian Barlow, has produced a beautiful volume recording nearly 200 plants from the Pharmacopoea Londinensis beds of the College Medicinal Gardens.The Illustrated College Herbal features paintings and late medieval woodcuts of nearly 200 plants and is authored by Jane Knowles, Henry Oakeley and Gillian Barlow. 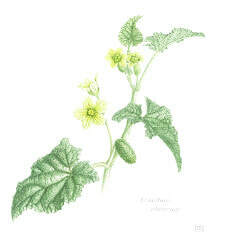 I have two paintings featured in the book - the squirting cucumber (Ecballium elaterium) and the figwort (Scrophularia nodosa). I attach a flyer for the book, which will be launched on 11th May and the original paintings and limited edition prints will be available to purchase from the artists and will be exhibited in the Council Chamber at the RCP in London from 20–31 August 2018. (Royal College of Physicians, 11 St Andrews Place, London NW1 4LE). 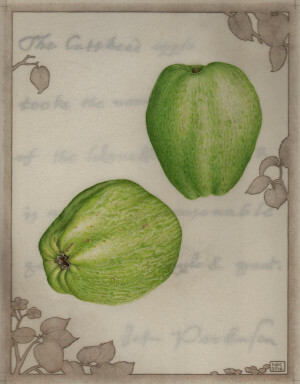 Tradescant's Orchard, the botanical art exhibition at the Garden Museum in Lambeth www.gardenmuseum.org.uk/ is now on! It features fruits that may have been grown in the Tradescant's market garden in Lambeth in the 1600's. It is celebrating the renovation of the museum and the showing of the Tradescant's Orchard portfolio, one of the finest horticultural treasures in the Bodleian Library. My contribution is the Catshead apple and was first described in this country by John Parkinson in his work "Paradisi in Sole Paradisus Terrestris"
From Thurs 5th to Sun 8th May I have been allocated botanical art exhibition space at the RHS Malvern Spring Festival. the show opens from 9am until 6pm and looks to be a welcome start to the gardening season. More details of the festival can be found at the RHS Malvern website ﻿www.rhs.org.uk/shows and as well as the botanical art exhibition there will be show gardens and plant exhibits, as well as talks, demonstrations and advice available. POSTSCRIPT: Very happy to say I was awarded a Silver Gilt Medal for my submission to the show. 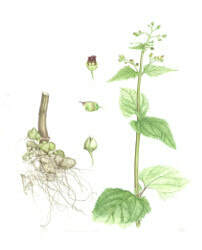 The paintings I submitted were a selection form those shown on my 'Medicinal herbs through the ages' page. This Christmas I will be at two local fairs - on 29th and 30th November (10am to 5pm) I will be at Bix Village Hall with The Bix Six and Friends for our regular Christmas do and then the following weekend Sunday (7th Dec) at St Andrew's Church Hall in Caversham for our Caversham Artists Christmas Gala - open from 2pm to 6.30pm. Both fairs feature local artists who make all their own work to a very high standard. 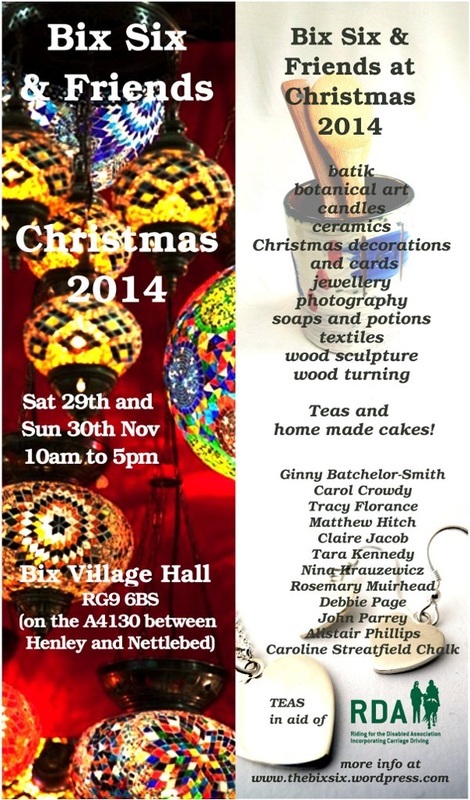 More info is on the posters below and on these websites thebixsix.wordpress.com and cavershamartists.co.uk. Hope to see you there! Many thanks for everyone who visited Bix Village Hall for Bix Six and Friends at Henley Art Trail and also those who came to my house for Caversham Art Trail. We had a great time with lots of visitors and demos. 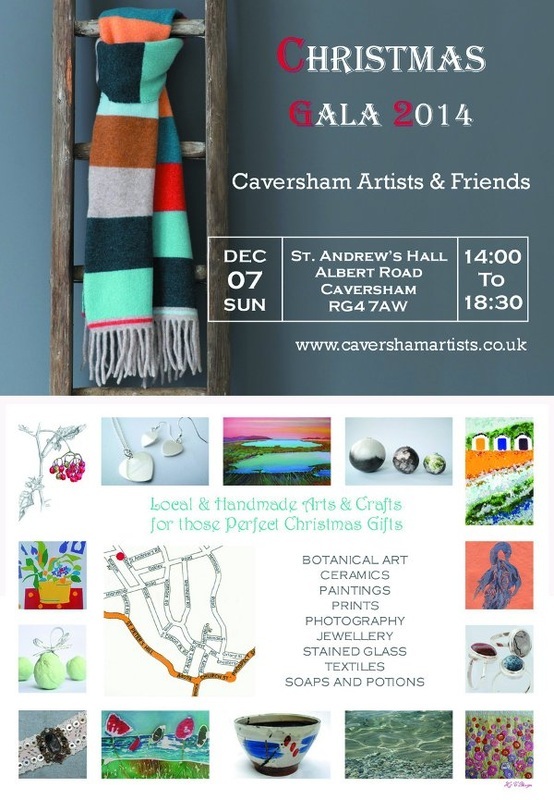 Planned winter shows will be at Bix Village Hall on the last weekend in November and then on 7th December we will be at St Andrews Hall in Caversham for our Caversham Artists Christmas one day event. Watch this space for more details later in the year.